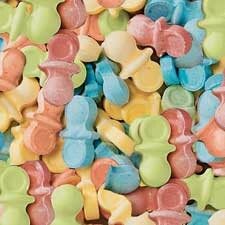 Pacifier Candy, in pastel colors of pink, blue, yellow and green, is as whimsical as it is delicious! Although perfect as a filler for any favor, this fruit-flavored candy is custom-made for the Pink/Blue Baby Bottle Fillable Favors and will show your guests you thought of everything on this very special day. Package contains 10 oz.